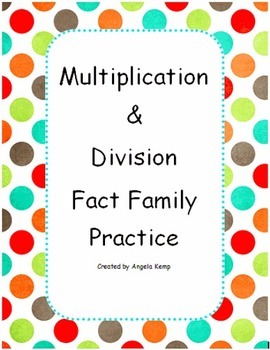 This Fact Family Practice with Multiplication and Division product shows students the relationship between multiplication and division. It helps students practice and solidify computational fluency in multiplication and division. Computation fluency will help students be successful in all areas of math. It is important for computation fluency to be in place for all students grades 4+ so students can focus their attention on more complex math concepts without having to spend time "figuring out" basic multiplication and division facts. Computational fluency with numbers 1-12 is also important because it will help students be more successful multiplying and dividing larger numbers in the hundreds, thousands, hundred thousands, etc. 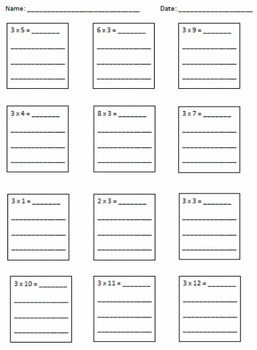 This product includes a worksheet for every number 1-12 (i.e. all the facts multiplying by 2). These 12 worksheets can be used as additional practice at home, during math centers, as students complete their classwork, etc. Having all facts 1-12 (12 worksheets) gives you the opportunity to choose the facts that each individual student needs to work on, so practice can be tailored to fit all students needs. The more practice students get with multiplication and division the more successful they will be in math.